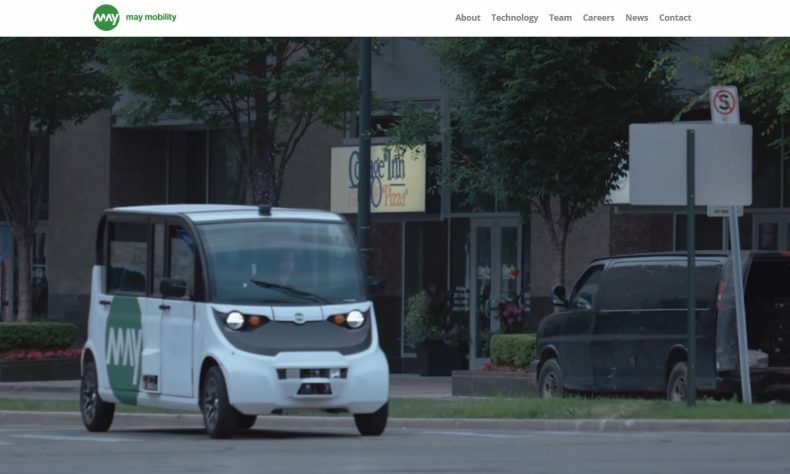 ANN ARBOR — May Mobility, the Ann Arbor-based startup that is developing self-driving shuttles for college campuses and urban areas, announced that two New York City-based venture firms, Millennium New Horizons and Cyrus Capital Partners, have joined its investor base, co-leading a $22 million Series A funding round. Also participating are Santa Clara, Calif.-based LG Technology Ventures and San Francisco, Calif.-based Thayer Ventures, alongside return investors Mountain View, Calif.-based BMW i Ventures, Palo Alto, Calif.-based Maven Ventures, Los Altos, Calif.-based Toyota AI Ventures, and Mountain View, Calif.-based Y Combinator. Company officials said the round will help May Mobility expand engineering and operations in order to meet growing demand. Currently, May Mobility focuses on the “last-mile” transportation market of short trips in urban cores. May estimates the size of that market at $28 billion a year. May’s commercial services currently navigate the streets of downtown Detroit, as well as Columbus, Ohio. These routes are in high-density areas, filling a critical need for customers and riders, but challenging for traditional autonomous vehicles. In the coming months, May Mobility will be launching public services in Grand Rapids, Mich. and Providence, R.I., with plans to announce additional commercial deployments in cities across the United States later in 2019. For more information about May Mobility’s products, technology, or career opportunities, visit https://maymobility.com/.